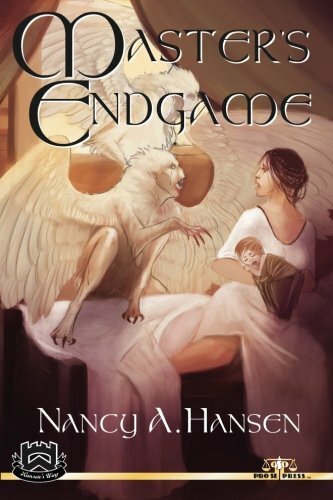 FINAL CHAPTER OF NANCY A. HANSEN’S EPIC FANTASY TRILOGY ‘MASTER’S ENDGAME’ DEBUTS FROM HANSEN’S WAY! An innovative publisher of Genre Fiction, Pro Se Productions proudly announces the third book in the acclaimed epic fantasy trilogy created by Nancy A. Hansen and published as a part of her author centered imprint with Pro Se Productions, Hansen’s Way. Master’s Endgame is now available in print and digital formats. War is coming to Greenwood. A joint coalition of the Dark Ones, led by a wily and powerful ancient adversary, have gathered on the borders of the enchanted forest. Their object: to reopen an all important portal to the shadow world of Terra Incognita, where they will release their fell brethren waiting on the other side into the world of the living once again. All that stands between this confederacy of evil entities and creatures bent on destruction and mayhem, is a single guardian Naiad, and straggling bands of half-starved Elves. Across the river, in the more peaceful lands of Humans, Callie's pregnancy is now full term. As the armies of friend and foe march into battle in the forest, her child's birth is imminent. Will this babe live long enough to become the savior who unites the scattered allies of the Light World once more, and beat back the Dark God's horde? Or will the ploys of the enemy's Master Summoner snuff out that little life before it has a chance to tip the scales of balance in the Light World's favor? These are the times foretold: the age of the Master's Endgame! The third chapter in Fantasy Pulp Author Nancy Hansen’s Trilogy brings the tale told in Fortune’s Pawn and Prophecy’s Gambit to an adventurous, explosive ending. Masterful at both elaborate description and edge of your seat action, Hansen delivers a fully realized heroine in Callie in Master’s Endgame, from Hansen’s Way and Pro Se Productions. Featuring evocative art by h-eri and logo design and print formatting by Percival Constantine, Master’s Endgame is available for $15.00 at Amazon at http://www.amazon.com/Masters-Endgame-Nancy-Hansen/dp/1511432055/ref=sr_1_1?ie=UTF8&qid=1427378034&sr=8-1&keywords=master%27s+endgame+hansen and via Pro Se Productions’ own store at www.prose-press.com. The final chapter in Hansen’s trilogy is also available as an Ebook for only $2.99 with digital formatting by Russ Anderson for the Kindle at http://www.amazon.com/Masters-Endgame-Fortunes-Pawn-Book-ebook/dp/B00V5ST8UO/ref=sr_1_fkmr0_1?ie=UTF8&qid=1427378087&sr=8-1-fkmr0&keywords=master%27s+endgame+hansen and most other formats at www.smashwords.com. The first two books in the trilogy, Fortune’s Pawn and Prophecy’s Gambit, are also available at Amazon, www.prose-press.com, and Smashwords. NEW MYSTERY AND CRIME SERIES DEBUTS FROM PRO SE PRODUCTIONS! M.H. NORRIS’ BADGE CITY: NOTCHES NOW AVAILABLE!